Bikaramba and I (@autom8) started following each other on Twitter soon after I started writing about cycling in Toronto (thanks @blogTO!) And thank you, Twitter. You have proven time and again that you are seriously the iconic face of social media. No one messes with how exceptional you are at connecting people, places and things. 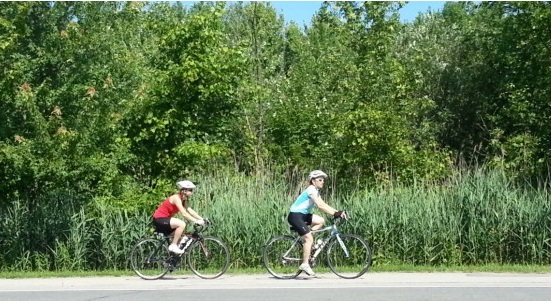 Bikaramba’s mission is to “make the amazing experience of discovering Canada by bicycle more accessible to others – both new and more seasoned riders.” Cycling from Toronto to Montreal (their ‘Classic Canadian Tour’) is in fact a brilliant experience. I have done this route myself in 2000 during the early days of Friends For Life Bike Rally (second annual). And in 2002, I also did a week long cycling tour of Provence in the south of France—so yes, I know exactly what the bike touring experience is like. And I think everyone should do it. “Active travel naturally attracts participants who are adventurous and enthusiastic, so our participants enjoy the trips and are thrilled to have the opportunity to explore Canada by bike,” notes Dorothea one of Bikaramba’s partners. Those experienced with bike tours know the score: it’s not Tour de France. Racing to the next destination misses the point of savouring the landscape, including some of eastern Ontario’s picturesque countryside, serene lake shore vistas and the gradual but distinct transformation in flora as you follow the St. Lawrence river towards Montreal. I am always curious about the initial departing and final arrival points of a tour. To this effect, Dorothea explains that the starting point for the Toronto tours is the hotel where riders stay the night before the start of the trip. Dorothea also notes that they haven’t had requests to provide return transport, as people usually like to spend additional time in Montreal, fly back to their hometown directly or take the train. Bikaramba’s tours tend to be in the summer/fall months but depending on demand they are always flexible in terms of adding more dates.